Sweet and sour flavors pair so beautifully with tender chicken. This simple three-ingredient crockpot sweet and sour chicken recipe is full of flavor and nutrition. And it's so easy to make! You can use boneless, skinless chicken breasts in this recipe if you'd prefer. In that case, the cooking time would be shorter, about 5 to 6 hours total. Make sure that you always cook chicken to a temperature of 165 F as measured with a meat thermometer for food safety reasons. And make sure you taste the sweet and sour sauce before you use it. Serve this recipe over hot cooked rice or polenta. Add a green salad tossed with cucumbers and grape tomatoes and drizzled with a creamy vinaigrette. For dessert, all you need is some ice cream served with hot fudge sauce or some homemade cookies. Cut the chicken thighs into 1-1/2" pieces. 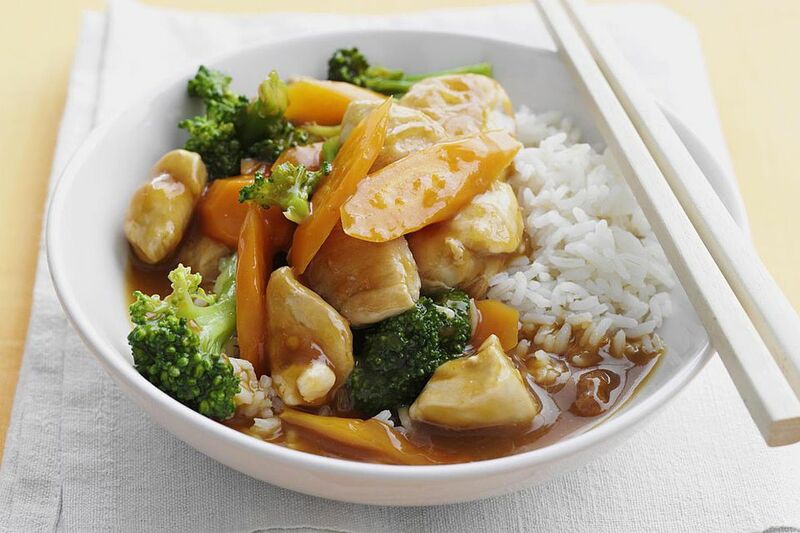 Mix the cubed chicken with the sweet and sour sauce in 1 3-1/2 to 4-quart slow cooker. Cover the crockpot and cook on low setting for 6 to 8 hours or until chicken is tender and no longer pink and is cooked to 165 F as measured with a meat thermometer. Twenty minutes before serving, stir in the vegetables, thyme, and pepper. Cover the slow cooker, increase the heat to high and cook for 20 to 30 minutes or until the vegetables are crisp-tender. Serve over hot cooked rice, mashed potatoes, or polenta.